I've been told that "The Da Vinci Code", a novel by a Dan Brown and before long a movie by Ron Howard, portrays a murderous villain who is a member of Opus Dei. I object to those who make money from imaginary miscreations and I cry over the masses who relish them. Opus Dei is just a secular catholic society of sanctimonious persons in pursuit of "saintliness" Spanish-style: lengthy prayers, austerity, discipline or scourge, hair shirt or cilice, in other words, persons who consider "redeeming themselves" by sharing Jesus' sufferings. Quite different is our concept of penitence based on The Revelation of Ares and the change into Good: love, forgiveness, nonjudgement, peace, spiritual freedom, etc., but none of us is likely to disregard catholics who are pursuing virtue (Rev of Ares 28/15) in a world where the word has been sadly losing its meaning. An old friend of mine (I've managed to preserve a few friendships previous to 1974) is a member of Opus Dei. He occasionally happens briefly to pilgrimage to Ares. He is no narrow-minded bigot. I imagine that he comes to Ares to get news of our assembly, as well, but we do not have anything to conceal. He is not doublehearted when he answers yes to the question "Do you love all of men and do you forgive all of offenses? ", because, just as we do, he strives to follow the Sermon on the Mount. I do not know the meaning he gives the other yes in answer to the second question, "Do you believe that the Bible, the Quran and The Revelation of Ares have emanated from God? ", but I am aware that he is a good man, which is enough to me. Imagining my friend to belong in a murderous or only malevolent organization would be an absurdity. Opus Dei means The Work of God in Latin. 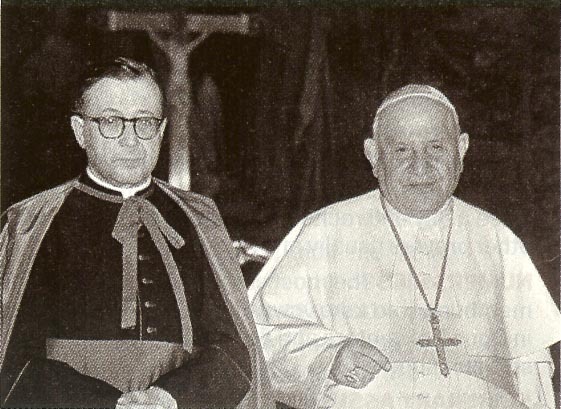 The society was founded in 1928 by a Spanish priest, José Maria Escrivà (standing by John XXIII in 1960 in the picture), for laymen and laywomen, whether married or nor, in want to leaving the everyday life in the mortification usually observed by clergy and the monks and nuns. Apart from the catholic doctrine, worship and concept of atonement, which Opus Dei's members comply with, the everyday time they devote to self-improvement is about equal to the everyday time the Ares Pilgrims devote or are supposed to devote to gaining virtue (Rev of Ares 28/15) and piety (35/5-6) so as to become men of the time to come (30/13), harvesters of souls. As always, whenever men in pursuit of discreet virtue are concerned, Opus Dei because of its very discretion looks shady to the big shots among sinners, who hold the reins of the world, and to their media, thrill dealers. Opus Dei is considered as a sect by a lot of people, who even suspect it of being engaged in secret malevolent activities. We Ares Pilgrims are suspected of similar misdeeds. I do not contend that Opus Dei is in agreement with the expectations of spiritual liberation, that we Ares Pilgrims strive to actualize. Likewise, we diverge from Opus Dei's many outdated, restrictive principles. But I believe that, the day catholicism and the Aresian faith have to narrow the gap between their positions, the talks between non-clerical people of virtue will be less toilsome. The catholics are well-placed among all those who are mentioned in The Revelation of Ares' beautiful verse 25/6, which we have made a prayer. The Revelation of Ares is not to win a global victory through disavowals and defections of believers leaving their religions in droves and joining us Ares Pilgrims, because the believing masses are no longer pagan as they used to be in ancient times. The Ares Pilgrims will forever remain a small remnant. The global victory will occur through exchanges of spiritual riches and collective re-examination of the Sources except those that have clearly been ruled out like John and Paul (Rev of Ares 16/12, 35/12) and a few others.